Active galaxies contain a supermassive black hole (SMBH) that causes vigorous radiation of electromagnetic energy as a result of rapid accretion of gas and dust. While almost all galaxies except dwarfs contain an SMBH in the center, active galaxies are rare – fewer that 1% of galaxies in the present universe. 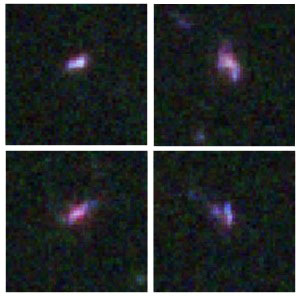 A very few active galaxies contain two active SMBHs. Even fewer have three. Before the latest discovery, only two examples had ever been documented in the literature. The most recent example was so obscure it doesn’t even have a name. This example is unusual in other respects as well. It is quite distant, having a redshift of z=1.35. That means its light has taken 8.92 billion years to reach us. We see it as it looked about 4.75 billion years after the big bang. Most galaxies at that time were fairly mature. Not this one. It seems to be quite young and irregular in form, with 4 separate components. Three of those appear to contain active SMBHs. Some of the details about this galaxy are not known very precisely. It’s (barely) possible that one or more of the apparent active SMBHs are actually bulges hosting very active star formation. But the spectroscopic evidence is heavily against that. The three SMBHs are not especially large as such things go. The masses could be as much as 3.1×106 M⊙, 1.0×107 M⊙, and 1.2×107 M⊙. However, these are upper bounds, and the actual masses could be only 20% as large. For comparison, the Milky Way’s SMBH is 4.2×106 M⊙, but many SMBHs are in the 109 to 1010 M⊙ range. There are several intriguing questions about this object. The first: how did it form? Is it a 3-way merger of smaller galaxies of similar size, each of which had its own SMBH already? In the modern universe, such mergers are very rare. The evidence is that they were also rare in the era of 5 billion years after the big bang. It’s a lot more likely that this galaxy is still rather young and in an early stage of formation. If that is the case, then there are very interesting questions about how the object can have three active nuclei. Cygnus X-1 was a very puzzling object when it was discovered in 1964, because (as the name suggests) it was an extremely powerful X-ray source. Since X-rays are (fortunately) blocked by the Earth’s atmosphere, the exceptional nature of the object was only recognized when it became possible to do astronomy from above the atmosphere, in this case during a sub-orbital rocket flight. Even today, Cygnus X-1 is one of the strongest persistent X-ray sources known. At the time of the discovery, black holes were considered to be perhaps nothing more than hypothetical objects. Their existence was allowed for as an admissible solution of the equations of general relativity, but they were considered by many astrophysicists to present such troublesome paradoxes that their actual existence was questionable. 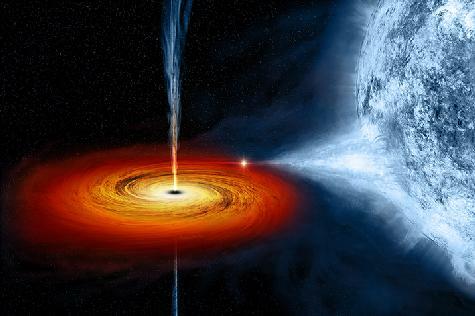 For instance, would a “naked singularity” perhaps exist inside a black hole’s event horizon? And would all the information associated with matter falling into a black hole be lost, in contradiction with principles of quantum mechanics? In the past 50 years, overwhelming evidence has been found for the existence of both stellar-mass black holes (such as the one in Cygnus X-1) and supermassive black holes at the centers of all but the smallest galaxies. Most of the troublesome theoretical paradoxes have also been resolved. There is now abundant observational evidence that Cygnus X-1 is a binary system consisting of a black hole and a blue supergiant star (HDE 226868). If you were to find yourself falling into a black hole, it would be quite an uncomfortable experience – not when you actually cross the event horizon of the black hole, but on the outside, just before crossing. The reason is that the gravitational force just outside the event horizon is so strong, the mere difference between the forces on the parts of you closest and farthest away from the horizon would be strong enough to tear you apart. The same is true for a star that got close enough, even if it was on a path that could actually avoid falling into the black hole. In spite of the large number of stars that typically orbit near a galaxy’s central black hole, TDF events are estimated to be very infrequent – about once per 100,000 years per galaxy. The present research involved a ground-based search involving observations of more than 2 million galaxies over a period of 10 years. Although 342 intense, well-measured flares were observed, it was necessary to exclude events that could have been supernovae or flares in active galactic nuclei instead of TDFs. (Supernovae are thought to occur 1000 times as frequently as TDFs.) Out of all the detected events, in only 2 cases was it possible to determine that the probability was extremely small the event was not a TDF. Interestingly enough, two other recent research reports have shown good evidence for TDFs, using space-based equipment. The first suggested that repeated TDF events right in our own galaxy are responsible for gamma-ray bubbles extending 25,000 light-years above and below the galactic plane. The model used assumed that a TDF would occur once every 10,000 to 100,000 years. The other recent case involved a flare that was bright enough to be a gamma-ray burst, except it lasted much longer. Instead, that event was more likely the result of a TDF that produced a very energetic jet of gamma rays and relativistic particles aimed straight in our direction. 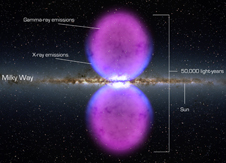 Since gamma rays are the most energetic form of electromagnetic radiation (far more potent than X-rays), the existence of large, though diffuse, clouds of them above and below the plane of our galaxy wasn’t something to be taken lightly. Last year, astronomers analysing data from NASA’s orbiting Fermi Gamma Ray Telescope made an extraordinary announcement. They said that Fermi had spotted two giant bubbles emanating from the centre of the galaxy, stretching some 20,000 light years above and below the galactic plane. These bubbles are clearly some kind of shockwave in which high energy electrons interact with photons, giving up their energy in the form of gamma rays. But what could have caused such a shockwave, which is many times bigger than astronomers would expect to see from a supernova? Today, Kwong Sang Chen at The University of Hong Kong and a few pals say think they know. They say the bubbles are the remnants of stars that have been eaten by the supermassive black hole at the centre of the galaxy. The researchers believe than their model also helps explain a completely different issue: the energy distribution of very high-energy cosmic rays. Supernovae that originate from the collapse of massive stars and are the power behind gamma-ray bursts have them. Supermassive black holes at the centers of galaxies have them. And so too do stellar mass black holes that are the remnants of supernovae that flared long ago. Jets. Intense jets of radiation and particles moving at nearly the speed of light. Jets occur frequently in objects of interest to researchers working on high-energy astrophysics. Yet they still aren’t well understood. GX 339-4 is the designation given to a black hole with a mass about 6 times that of our Sun and located 20,000 light years away. NASA’s Wide-field Infrared Survey Explorer (WISE) records images covering the whole sky every 11 seconds. This made it possible to capture repeated images of a small area around GX 339-4 at the base of its jets. Its jets are fueled by an accretion disk which in turn is fed by gas sucked from a companion star. What was surprising about the observations was the wide variability of both the size and the brightness of the small region where the jets originate. The results surprised the team, showing huge and erratic fluctuations in the jet activity on timescales ranging from 11 seconds to a few hours. The observations are like a dance of infrared colors and show that the size of the jet’s base varies. Its radius is approximately 15,000 miles (24,140 kilometers), with dramatic changes by as large as a factor of 10 or more. The new data also allowed astronomers to make the best measurements yet of the black hole’s magnetic field, which is 30,000 times more powerful than the one generated by Earth at its surface. Such a strong field is required for accelerating and channeling the flow of matter into a narrow jet. The WISE data are bringing astronomers closer than ever to understanding how this exotic phenomenon works. There’s been an ongoing debate (of sorts) over the supermassive black holes that seem to exist in most medium to large-size galaxies – did their growth precede, parallel, or follow the growth of the galaxy itself? This arises out of the rough correlation that exists between the size of a galaxy and the size of its black hole. Relatively large black holes have been observed even in nearby dwarf galaxies. This suggests that black hole growth may precede galaxy growth. The best way to investigate the issue is to observe many galaxies in the early universe, which is difficult because galaxies were smaller and dimmer then. Observations have been reported of very small samples and support the idea that the black holes grow first. There’s a new study out that surveys 28 small galaxies as they were about 3.3 billion years after the big bang. The galaxies are only about one seventh the size of previously studied galaxies of that age. However, by combining the data from all the galaxies, there is evidence for active galactic nuclei in the sample, and hence the presence of supermassive black holes. Using the Hubble Space Telescope to probe the distant universe, astronomers have found supermassive black holes growing in surprisingly small galaxies. The findings suggest that central black holes formed at an early stage in galaxy evolution. “It’s kind of a chicken or egg problem: Which came first, the supermassive black hole or the massive galaxy? This study shows that even low-mass galaxies have supermassive black holes,” said Jonathan Trump, a postdoctoral researcher at the University of California, Santa Cruz. A monstrous black hole at the heart of one galaxy is being devoured by a still larger black hole in another, scientists say. The discovery is the first of its kind. At the centers of virtually all large galaxies are black holes millions to billions of times the mass of the sun. Models simulating the formation and growth of galaxies predict their black holes evolve as the galaxies do, by merging with others. Astronomers had witnessed the final stages of the merging of galaxies of equal mass, so-called major mergers. Minor mergers between galaxies and smaller companions should be even more common, but, strangely, these had not been seen until now.